Welcome to the North!! That’s right peeps, this week saw the ‘Tommy’ clan erupting on the beautiful city of Leeds ready for a fortnight of chaos at the West Yorkshire Playhouse. Not before our ‘Sensation’ of a Technical, Wardrobe & Stage Management Team (See what I did there? Check me and my ‘Who’ references!) finished the whopping ‘get out’ at 4.30am on Sunday morning… Guys, you are awesome! Everybody was particularly better rested as well having had a sacred extra day off due to the Bank Holiday on Monday. 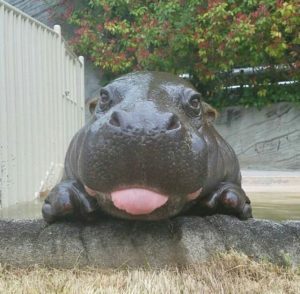 Hearns (Ensemble) certainly made the most of his time by going for a picnic on Monday and posting pictures of cute hippos all afternoon while Giles (Technical Stage Manager) arrived at his digs only to discover that his room had 4 double beds in it… you could have housed the whole company up there mate! Tuesday was another blissful ‘sit and do nothing’ day for the cast (sadly not for the crew who had a big fat ‘get in’ to do) where Julian (Voice of Tommy) revealed that he “wanted to rub salt in Alim’s (Frank) eyes for revealing too much information about the latest episode of Ru Paul’s Drag Race” I can confirm that he did not carry out this action in the end before you all worry! Tuesday also saw me (Hawker) arriving at my new house for the fortnight which I would be sharing with 4 of the lads… luckily Nicole (Steve’s Good Lady) was staying with us too to help break up the testosterone… thank you please! Wednesday rolled around and at 8am BBC SeeHear aired a feature that they had done on ‘Tommy’ which was fab. 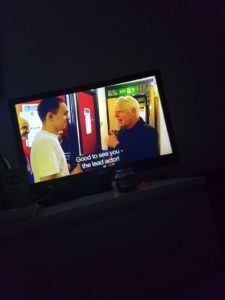 It was slightly early for me so I did catch it (and you can too) on BBC iPlayer. Following this we all convened at the West Yorkshire Playhouse, our largest venue, for a lovely ‘Meet and Greet’. This technical rehearsal was being led by lovely Nickie (Associate Director) and she got us all to stand and show and audio describe our ‘sign names’ where we discovered that Adam’s (drummer) new sign name is now the oboe… random! We were also introduced to three new BSL interpreters, the lovely Katie, Davie and Susan – welcome all! However, Pickles (Garry’s PA) had only been in Leeds for ten minutes having just returned from a work trip to India and managed to break a chair… one naan too many was it Mr Norman?! It was also during this tech session that Alim was back to his ‘scare cam’ antics, his victim this week being Lukus (Cousin Kevin) in his own dressing room who yelped and subsequently fell of his chair… the funny thing was, he knew Alim was there the whole time! Meanwhile Kirsty (Wardrobe Manager) found herself in a pickle as had misplaced one of William’s (Tommy) rather fetching woolly sweater vests. It was only whilst watching Lukus on the scare cam that she spied it on the rail behind him… everything happens for a reason eh?! Lukus then decided to have some fun of his own by pulling down Hearns’ trousers right before we were to enter for the top of Act 2… I cannot stress enough that this was a rehearsal – not during the show hehehehe! By Thursday we were all geared up for a full on Dress Rehearsal on the stage followed by our Leeds Press Night. The stage here is so wide and it was interesting seeing how we were going to adjust to playing to such a vast space but we did… cos we’re fab! However, we did get a note from Nickie which said “in this venue you can see everything behind those screens, that’s all I’m saying”… make of that what you will!!! In other news we learned that Amy (Sally Simpson) was chucked off the Rounders Team in Year 6 for being too competitive, I managed to bust my foot during the dress rehearsal (but was consoled by a big bag of Doritos and a lovely bottle of Grape Juice from Stacey aka Mrs Simpson which did seem to help – thank you!) and Shekinah (Voice of Nora) demonstrated new levels of withdrawal when she learned that she was not going to have any meat for the whole day. Thankfully somebody produced some chicken from somewhere and all was well again! 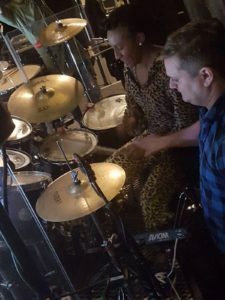 Highlight of the day was watching Donna (Nora) rock out to Michael Jackson’s ‘Dirty Diana’ in the dressing room while clad in a leopard print onesie! Nice! So we did the Press Night show and it was pretty amazing, the audience were all on their feet at the end and we all had a lovely time! So of course we all got dolled up and had a cheeky little shindig in the theatre complete with bubbles and munchies… thank you WY Playhouse! Later on, we did find ourselves heading on down to Queens Court where Amy found herself having some fun with the ramps they had put down for us! We were greeted by an articulately ‘slick DJ’ (another cheeky show ref) who announced upon our arrival “you’re either on a geography field trip or you’re all in a show… let me guess” and he subsequently played ‘Pinball Wizard’ and ‘Sensation’ for us… wow, that guys either psychic or had inside information! He continued to entertain us throughout the evening with statements like “we were going to close in ten minutes then you lot came in…I hope you all get alcohol poisoning and the show gets cancelled tomorrow” and “someone came in earlier and said that they had seen ‘Tommy’ and that it’s amazing, there’s lots of attractive people in it… so when you all came in I knew it was you lot cos there aren’t this many attractive people in Leeds!”…I wouldn’t go that far but thanks!! He then continued with the compliments by telling lovely Becky (Newpaper Vendor) that she was beautiful (which she is) and looks like Audrey Hepburn and then announced that he was in love with the boy in the red braces… lucky Hearns who turned a bright shade of crimson as a result! Thank you for being so fun Mr DJ, you provided a very fun night for us all. Following all this excitement there was only one thing left to do… hit McDonalds which, in Leeds seems to have some sort of bouncer protected queuing system going on. This was the first time I’ve ever been ID’d for a burger but hey ho, I had my driving licence so I was safe to order my ‘Filet O Fish’! This was not such great news for Steve’s girlfriend Nicole however, who woke on Friday morning to a sea of ‘Big Macs’ all over the bedroom floor… lovely! Friday saw us saying goodbye to Nickie after a fab tech with her but not before she and Peter (Acid Queen) did a brilliant interview for BBC Look North which can also be found on BBC iPlayer! (Cheeky plug!) She did also ask Lukus during our noted session: “Where are you taking Tommy?” Lukus replied “To the park”, Nickie responded with “Oh, it sounds like you’re taking him to the pub!” Oops! Oh, and Anthony’s fab dad told Max (Captain Walker) that he would buy him a Yorkshireman flat cap if he learned the traditional ‘Ilkley Moor’ song, so he did and he is now the proud owner of a classy piece of headwear! 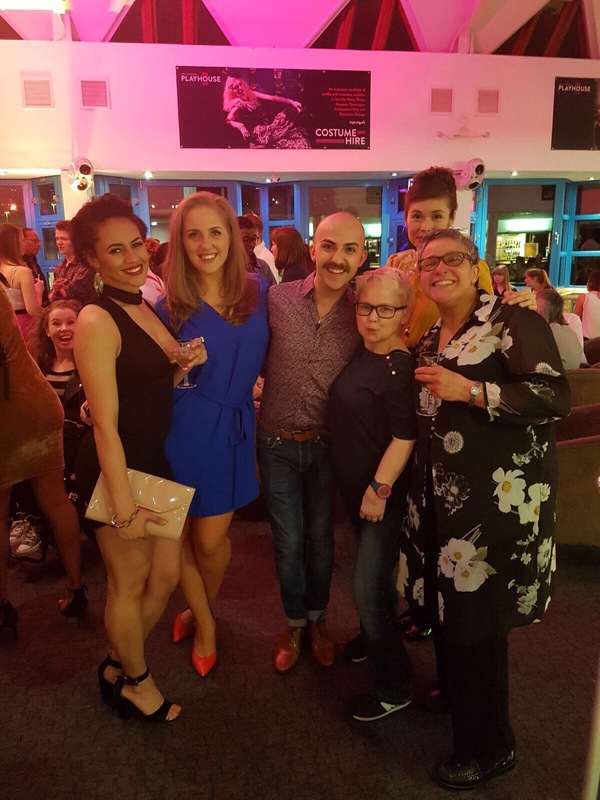 We were also treated to a surprise visit from our fabulous BSL legend, Jeni Draper who had snuck in to watch and say hello… we’ve missed you! By Saturday, ‘a vague haze of delirium’ (spot the ref) had set in and found myself, Max, Pickles and Garry (Uncle Ernie) planning a trip to Bronte Land to sample the famous Bronte burgers… and wondering if we would get a portion of ‘Wuthering Fries’ served up by a lady called Cathy?! 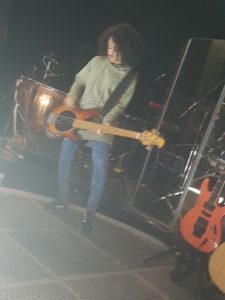 This was also the day that Kirsty announced that she thought that the winch that is turned to move the band riser was a musical instrument… hehehehe. We soon snapped out of the madness and ploughed into the matinee which had a group of Natasha J’s (Dancer) students and they were a euphoric bunch – we should get them back for every matinee! They really led the audience and I have to say it was probably one of the most enjoyable matinees I’ve ever done (except for the midweek one in Bath on ‘Our House’ which we shan’t talk about!!). Anyway, what a great show and audience… thanks guys! We had a couple of BSL notes post show though with fab Jeni one of which was for the smiley Matt (Voice of Tommy): Jeni : Matt, what are you signing there? Matt: ‘It doesn’t matter, she’s ugly’… why? Jeni: oh, because you’re actually signing ‘thin is better’! Wow, my inner feminist is screaming! Later that day, we saw Donna and Natasha J having a cheeky drum and bass guitar lesson with Steve (bassist) and they were naturals… good to know we now have cover eh?! Meanwhile, Hearns bought a violin on eBay which arrived today and he was extremely excited about it (just so you know, it’s one of those that gets worse before it gets better!!!) Oh, and William, Matt and Hearns were caught having a full blown pillow fight in their dressing room… such love! Post show, we saw Patricia taking charge the French Horn again as it was sent to the brass hospital… again! So Sunday rolled around and many of us stuck about as it’s a pretty epic journey to get back to London just for one day so we all took full advantage. Garry, Pickles and Stacey trotted off to Huddersfield to watch the football while Anthony was tickled pink to learn that his beloved Bradford FC were on their way to Wembley following their Sunday victory! Well done all! 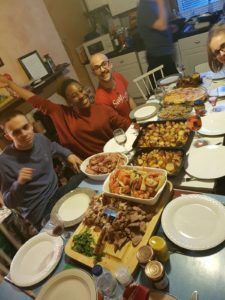 This was all round up by myself and Steve cooking up a roast dinner for twelve in our digs which was so much fun to do and a fab night was had by all! The whole feast would have been nothing however without the addition of Alim’s creamy leeks… blooming creamy leeks!!! Needless to say, we were all sufficiently stuffed so we popped a virtual game thing on William’s head and sent him round a haunted house while we let it all digest! The roast dinner to end all roast dinners!